Since everyone seems to love the before and after shots so much, I’m going to continue the trend a bit, while using the pictures to make a point. One of my favorite scenes from a home-design show was when the designer would go into a house and totally remove EVERYTHING from a room, and then paint it white, including putting back a few white pieces of furniture as place-holders for what the room functioned as. The homeowner got a totally new perspective about what that room COULD be, instead of what it was. Then, they were able to ONLY put the things back in the room that they truly wanted to have there. They were also able to change the color palette without confusion from what was before. When we moved into our home, I knew that there would have to be a lot of “whiting out” just so I could think about what I wanted. Many of the walls were green – brown variations, with lots of yellow undertones. Those were just not my style. The tile on the floor and shower is turquoise, and the grout is brown. 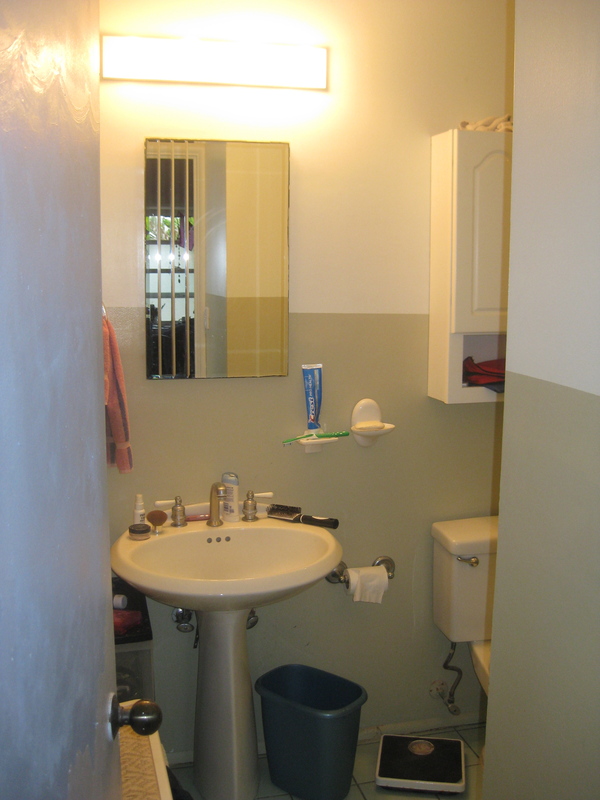 I think the wall paint color came from the shower curtain, which had that color greeny-brown and turquoise in it. And the biggest distractor to me was all the STUFF in the bathroom, including lots of little things like the soap and toothbrush holder on the wall. I actually didn’t mind the turquoise (I really love turquoise and clean blues), but knowing my penchant for white and bright, and of course for my uncluttered and more minimal style, I had to change this bathroom. This particular change would be a super cheap “refreshing” instead of an actual remodel. I decided to paint the whole bathroom out in bright white (gallon of bath enamel paint about $30) and add a new light fixture (also about $30 from Home Depot). 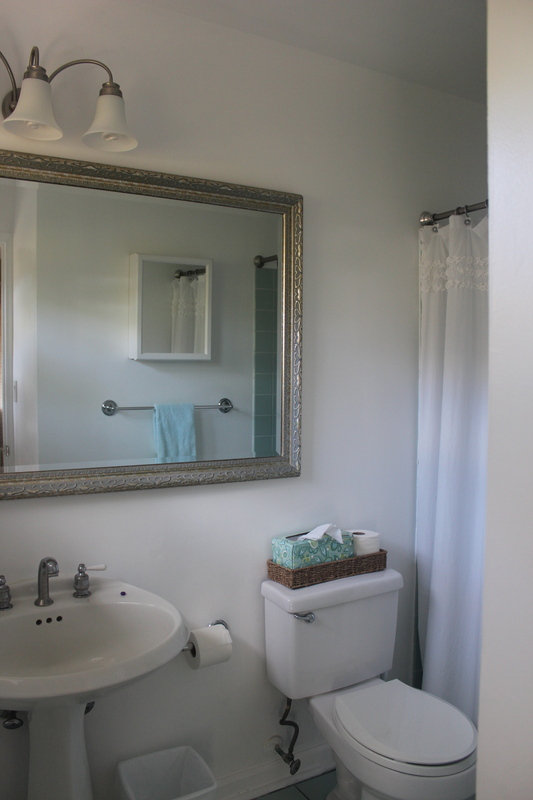 We also put up a big mirror and a small medicine cabinet that we already owned. We also put up a white shower curtain (my splurge for the bath from Target’s Shabby Chic line about $40). And I really love those baskets that go on the toilet tank to hold tissue and toilet paper. These were from Wal-Mart and were less than $10. And if you look really hard, on the right side of the sink is a dark purple piece of candy one of my kids must have left 🙂 It’s not actually part of the decorating scheme. So, the next time you’re stuck with what to do with a room, try taking out everything but the big, basic pieces of furniture (in this case, the toilet, sink, and shower) and prime the room white. Then you will be able to re-imagine what you really want it to be! This entry was posted in Bathrooms, Before and Afters, Color, Decorating, Home Organizing, Quick Tips and tagged bath, bathroom, before and after, color, guest bath, organize, paint, vanity, white by organizedohana. Bookmark the permalink. You totally transformed the bathroom, I love it!